A beautiful thing happened last Saturday night: Nat Fyfe, football perfection, recorded this season’s third Ablett. He followed on from Steele Sidebottom the week prior, and Tom Mitchell from Round Two. There has now been 31 Abletts recorded in AFL history, with Sidebottom the 18th player to do so. 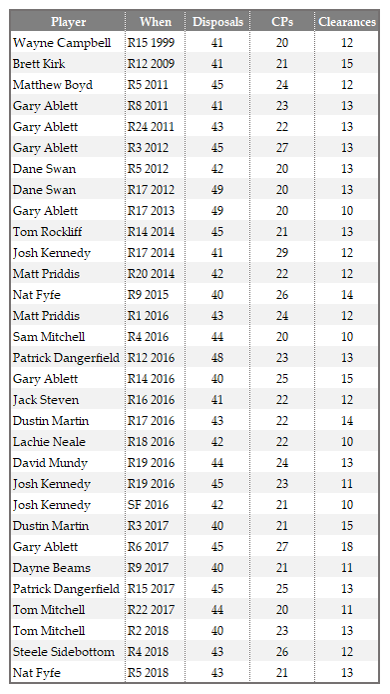 Both Fyfe and Mitchell have recorded two Abletts in their careers, and are two of eight players to have more than one Ablett to their name. Now I know what you’re thinking: this is a pretty incredible feat. Not only does the fact that an Ablett is named after the all-time Ablett record holder, Gary Ablett Junior, imply prestige, there has been thousands of players and exponentially more player games throughout the history of the league. To be in such rarefied company, to be a member of the Ablett Club, in worthy of the sort of praise reserved for the greats of modern Australian football. Now I know what you’re really thinking: WTF is an Ablett? An Ablett, friends, is a collaboration between Onballers and The Arc born of pure happenstance – the kind that lands you your life partner merely for the fact you stood next to someone on a train, and happened to drop your bag just as they did the same. Ok it’s a bit less creepy than that but you get the picture. An Ablett is at a fundamental level a brain fart made by yours truly crystallised by the inimitable Matt Cowgill, on a fateful night in early April. In reviewing Fremantle’s Nat Fyfe’s stat line for the evening against the Cats, I noticed the following. The week prior Mitchell had gone slightly further. That looked extraordinary. 40 touches, more than 20 contested possessions, more than 10 clearances. A 40-20-10, not dissimilar to the triple double in basketball, albeit with some extra units of ten added plus specificity as to the categories required. Matt is a member of the Super Secret Footy Wonk Chat Group, and my tweet was like his bat symbol. It became immediately clear Mitchell’s line was a rare event indeed. To that point, just 29 instances of the 40-20-10 had been recorded. And so, the Mitchell was born. We’re almost there, I promise. Noting the table in the tweet above, Triple M’s Rudi Edsall’s inner Cat fan came to the fore. Thus, the Ablett was born. And wouldn’t you know it, since an Ablett became a thing (and friends it is a thing, don’t look at me like that) there has been two more Abletts. The lifelong Ablett tally stands at 31, from the time Wayne Campbell broke the ice in Round 15 1999 to Fyfe’s effort in the weekend just past. The only wrinkle on this otherwise pristine creation is two of the stats used to calculate it – clearances and contested possessions – were only created themselves in 1998 and 1999 respectively. But this is what we have. It is an utterly arbitrary statistical creation, with no predictive value nor use outside of the very small – but growing – group of bonkers football nerds that inhabit our relatively tiny nation. But it’s fun, right? And although it’s arbitrary, guess what? The last five Brownlow medallists – Ablett (2013), Matt Priddis (2014), Fyfe (2015), Patrick Dangerfield (2016) and Dustin Martin (2017) – have recorded an Ablett in their Brownlow medal year. Not predictive, but as far as coincident indicators go that is a fairly impressive strike rate. And wouldn’t you know: Tom Mitchell sits second on the Brownlow medal betting market through five weeks of football. While 31 Abletts have been recorded, 208 other player games have come mighty close. These guys got within 10 per cent (36 disposals or more, 16 contested possessions or more, and eight clearances or more) of each of the categories, or exceeded one or two but couldn’t quite get all the way. Some 91 players have recorded near Abletts. Here is the top 10. Ablett, Sydney’s Josh Kennedy and Geelong’s Patrick Dangerfield sit atop the near-Ablett throne with 11 each. The final thing that strikes me about an Ablett is the way the volume of Abletts in a given season has changed over time. 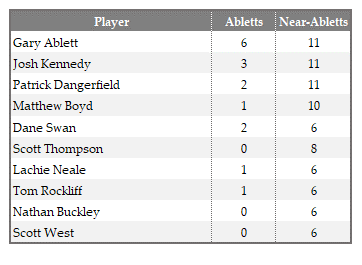 It took Brett Kirk a decade to double the number of Abletts in the AFL, after Campbell was the first to do it in 2009. There was none in 2010, before three in 2011 and 2012 and just one in 2013 and 2014 respectively. We had three in 2015, too. Since then, there has been a veritable explosion in the number of Abletts: 11 in 2016 (the same number as 2011 to 2015 combined), five in 2017, and three in just five rounds of 2018. It speaks to the trend we noted last year: the rise of the accumulators. So while we’ve only seen 31 Abletts to date, one would expect it to be a more regular occurrence going forward. And I solemnly swear, as founder of the Ablett, to be vigilant in my monitoring of individual player stat lines for the achievement of an Ablett. Feel free to join me.